Deer range free in the Texas Hill Country. Pictured is an Axis doe, an exotic deer imported from India. 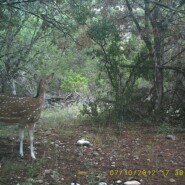 These deer thrive in the Hill Country and outnumber the native white tail. The Axis breed year round and are quite prolific. The meat is very tasty and not as gamey as the native deer. The antlers are large and are coveted by trophy hunters. On my ranch, Ambush Hill, I have feeders with timers set to sling corn early in the morning and late in the afternoon. The deer become easily accustomed to the feeder and are often waiting for the timer to scatter the corn. Turkeys and wild hogs also compete for the corn. I consider shooting deer at a feeder shooting, not hunting, but some hunters enjoy killing the easy way whereas others like to walk and stalk. The price of corn has risen drastically to over $11 a sack making feeders an expensive habit. I remember when corn was about $6 for a 50-pound sack. The price of deer blocks, mineral blocks and salt blocks has also risen appreciably. Never the less, hunters from all over the country flock to the Texas Hill Country during hunting season. Considering the number of animals killed, the deer population has not decreased appreciably in the 18 years I have lived at the ranch. So who wins? I think it’s a draw. Sonja Rose Klein is a native Texan and graduate of The University of Texas. After retiring, she lives up a canyon in west Texas, where she gardens, writes, and raises sheep and goats. She is active in the nearby communities of Barksdale and Campwood and haswon awards for her poetry, essays and short stories. Sonja is an adventure traveler, having visited remote places around the world. She prefers the solitary journeys and knows her way around a shotgun..